Apologies for my blogging hiatus, I've actually been on holiday but fear not, I've returned to tell you about the most amazing event taking place at The Bowes Museum on September 17th. 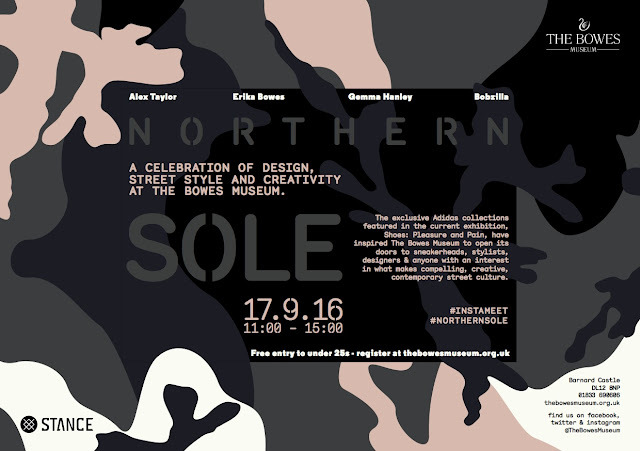 'Northern Sole' is a celebration of all things shoe, and ties in wonderfully with the current 'Shoes: Pleasure and Pain' exhibition. And what's even more exciting is that if you're under 25, the event is totally free!! Featuring amazing shoe experts and the return of the wonderful Frances Moffatt who will be offering pop-up shoe illustration on the day, the event is a must for shoe lovers everywhere. You can read the official press release for the event below. I've been lucky enough to have been asked to come along and review the event, so if you see me give me a wave-I'll be the the one drooling over the Roger Vivier for Christian Dior! Sneaker culture kickstarts an event which brings design, street style, photography, fashion and creativity all under one roof on Saturday 17th September 2016. The exclusive Adidas collections featured in the current exhibition, Shoes: Pleasure and Pain, have inspired The Bowes Museum to open its doors to sneakerheads, stylists, designers and anyone with an interest in what makes compelling, creative, contemporary street culture. Headlining the event, which runs from 11am - 3pm, are industrial designer, Alex Taylor, who pioneered the innovative Primeknit Adidas trainer for the London 2012 Olympics; stylist and photographer Erika Bowes, who will share her passion for street style; Gemma Hanley, Head of Footwear Design at Lulu Guinness, and local visual artist Bobzilla. The Adidas collections in the exhibition belong to two passionate Northern collectors of the brand, Ross Macwaters and Neil Pestell, who own 2,600 pairs and counting between them. They were delighted to lend some of their iconic footwear to create an exclusive ‘trainer wall’ in the show, following the Museum’s approach to acknowledged authority Stephen Donald, from Potency. The wall is an addition to the exhibition organized by the V&A, and fittingly forms part of the ‘obsession’ theme. To complement the trainers, visitors can explore the technology and style of the top brands on the app created by U-DOX - an innovative digital version of the Thames and Hudson book Sneakers: The Complete Collectors’ Guide installed next to the sneaker display. The two collections span more than 50 years of the brand – Neil has a pair of blue ‘Ford Fiesta’ trainers from 1975, made to coincide with the launch of the Ford Fiesta car, which he occasionally wears even though they are the only known surviving pair of the 100 made. Ross likens his mainly post-2000 collection to ‘laying down good wine,’ usually buying in his size even though 95% of his shoes remain unworn. However, he did splash out £1,600 on a rare pair of ZX 8000 that Adidas made in a single size, UK 8.5, which are much sought after as there are thought to be only 50 in the world. However, the key moment for the brand came in the mid 1980s when the group Run-DMC began wearing ‘Superstars’ – created as a basketball shoe rather than a fashion item - simply because they liked them. Adidas learned of this and a number of its executives were persuaded to attend a gig at New York’s Madison Square Garden, where the band urged audience members to each take off a trainer and wave it in the air during a performance of their song My Adidas, creating a fusion of lifestyle, music and trainer culture which ultimately resulted in a $1 million endorsement deal for Run-DMC just to represent the brand. A pair of iconic Superstars is on show in the exhibition. “It was a difficult choice as to what to include on the trainer wall, but we went for diversity – classic models from Europe, Asia and America – with the aim of displaying the best mix of what’s happened in Adidas over the years,” said Stephen, who helped Ross with his choices. For potential ‘sneaker heads’ young and old, Neil and Ross offered advice on how to begin, with both stressing the importance of buying only what you like rather than chasing what other collectors buy simply to sell on, although they both admitted to ‘spending more than I should’.